As I posted about last year, when I was on my trip to Cozumel and Playa Del Carmen I had read that there were cenotes (large watery sinkholes) scattered throughout the area. They are world famous in this part of Mexico for their natural beauty and make a fun trip for exploration and snorkeling. Most of them are filled with amazingly clear freshwater and just the right temperature for cooling down and escaping the Yucatan’s heat. 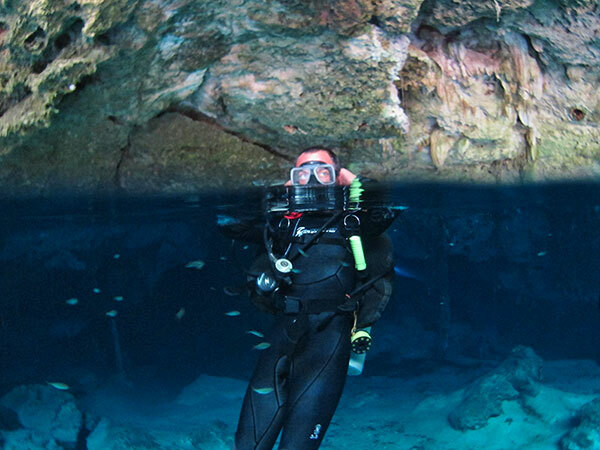 Many scuba divers have a cenote or cavern dive on their bucket list. 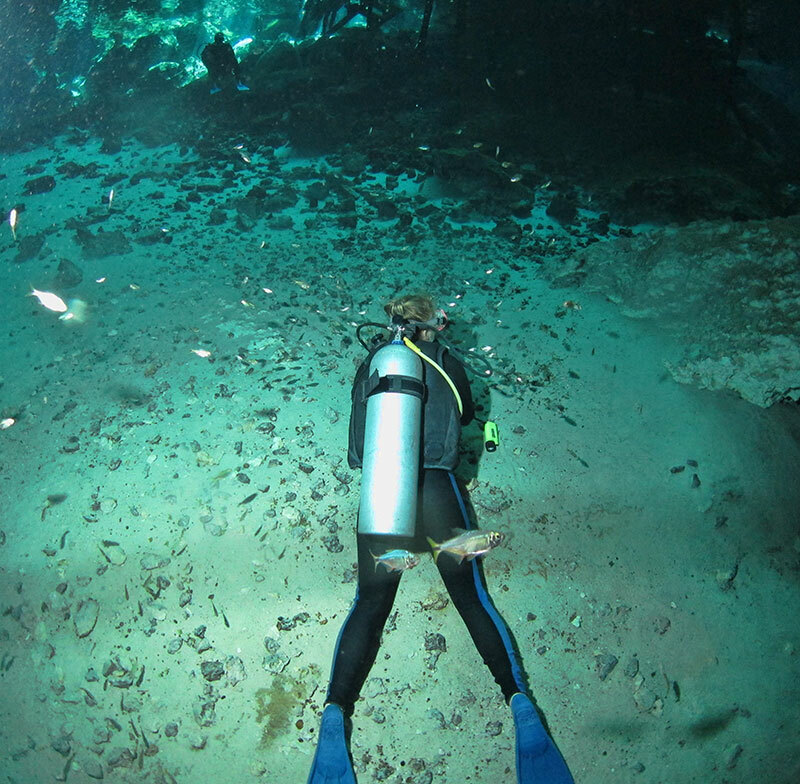 Dos Ojos is perfect for a first dive of this type because of it’s size and visibility. This was my first time ever diving into a cave or cenote and while it was amazingly fun as you watch you’ll know why it also came with anxiety. 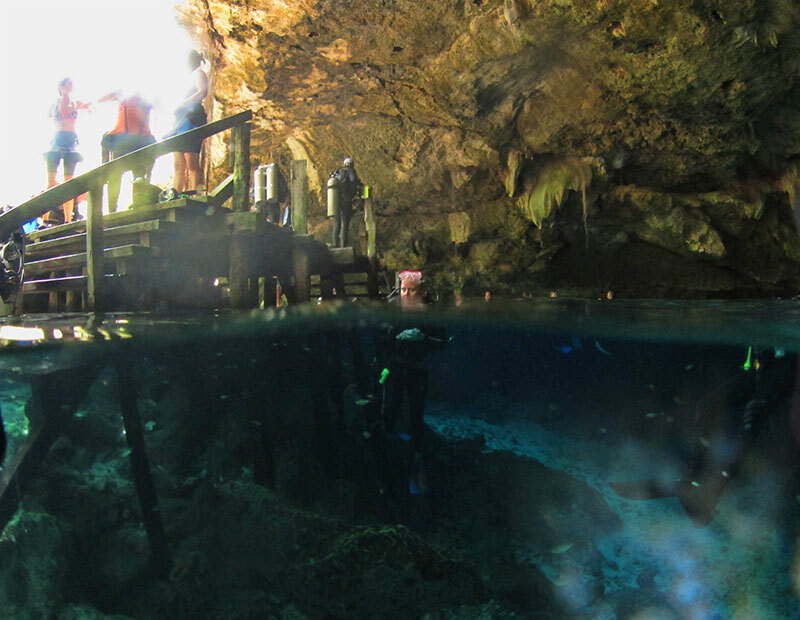 This cenote features extremely clear freshwater, a bat cave where you can surface (only accessible to divers), and a halocline (where freshwater and saltwater meet and mix together). However, cavern diving can be very dangerous, never attempt it alone or without the proper training. In the video there are three divers including me, I’m holding the camera behind everyone else. The only lights you see are the ones we’re carrying. After submerging into the cave it’s pitch black except for the tiny flashlights we carried in with us. A small yellow line of rope is our guide through the pathways and helps to keep from getting lost or disoriented, which could result in running out of air and drowning. About halfway through the video you’ll see us come through the final stretch of cave out into the opening. For this trip I had upgraded my camera setup significantly. I was using a Canon S95 with the Fisheye Fix Underwater case, an attached strobe (light) and a wide-angle lens. Not the cheapest setup but still fairly entry-level as far as underwater photography goes. Amazing! I love that you got some footage of your dive. 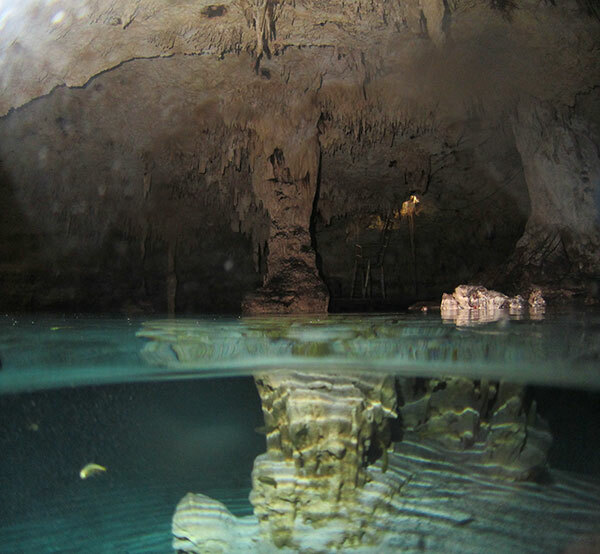 I snorkeled in one of these caves and it was one of my favorite experiences. For some reason I can’t wrap my head around breathing under water, so I don’t scuba dive, but I love seeing videos of it! 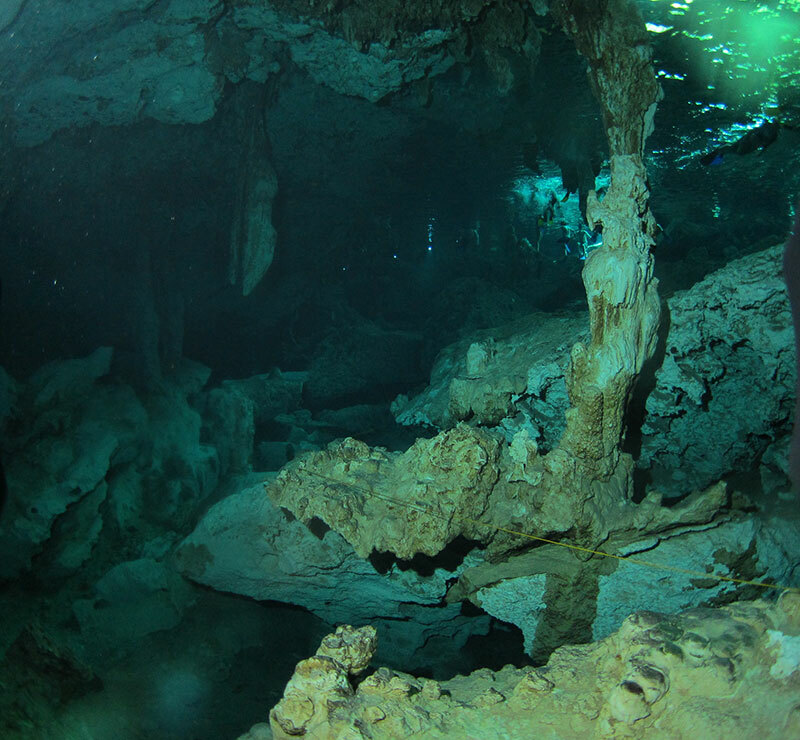 Do you know which cenote you visited? In another post I mentioned how hard it was for me during diving lessons.. the breathing underwater is weird at first but once you get the hang of it.. it’s so worth it! It looks like an otherworldly experience though I don’t think I could do it. I don’t like the thought of having just a rope as my guide but I can appreciate the beauty of the place. The real guide is the divemaster you hire to take you in. Ours had been through the cave hundreds of times and he also came equipped with 2 tanks rather than one, and we all had backup flashlights, in case there were any emergencies. The dive shop and him did a good job preparing us before going in. Another reason Dos Ojos makes a great beginner option is because the pathways are all large (no squeezing through or cramping) and never very far from the entrance.